Sort the color-code graduated geometric shapes by color or size. Mix and Match to create size or color patterns. 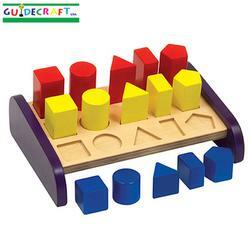 Develop geometric recognition, counting, and shape sorting skills. Improves fine-motor skills. Sturdy wooden construction with rounded corners and smooth edges, safe non-toxic paints with a clear finish. Raised base accommodates floor or tabletop play.